The clean, elegant design of Antitype caught my eye immediately. 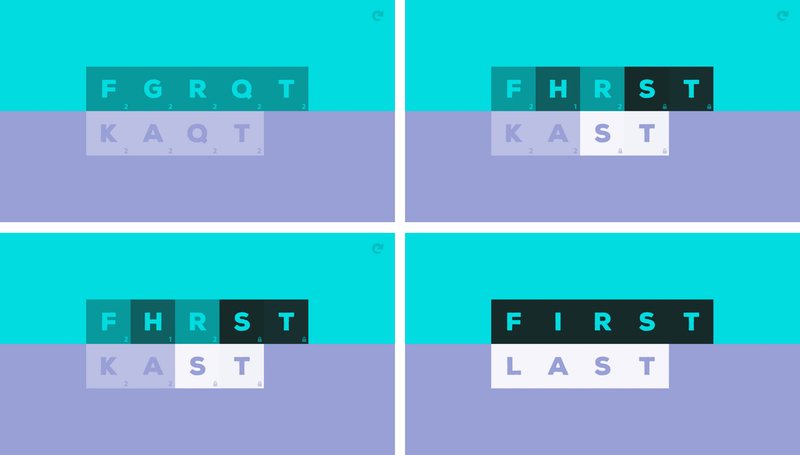 It’s a scrambled word game from BorderLeap that’s all about opposites. From its design to its gameplay, what makes Antitype unlike other word games is its unique approach that requires you to think about its puzzles differently than you would other word games. That makes the rules a little hard to grasp when you first try Antitype, but once you have the system down, it’s addicting. Antitype presents you with two scrambled antonyms. Your goal is to unscramble the words. What’s different about Antitype is how you unscramble the words. Tapping on any letter changes the letters adjacent to it by incrementing them to the next letter in the alphabet. That means if you tap a letter in the middle of the top word, the letters to either side of it change, as does the letter in the antonym directly below the letter you tapped. What doesn’t change is the letter you tapped. It’s a subtle and clever mechanic that fits with the ‘opposite’ theme and requires you to consider your moves from a new perspective compared to other games where you expect interactions to cause direct results. One way to solve Antitype’s puzzles would be to randomly poke around at letters until you find the combination that works. That isn’t possible in Antitype though, because there are little numbers on each letter tile that indicate how many times they can be tapped, which requires you to be thoughtful in your approach. If you get stuck and have no more moves available, you can restart the puzzle or tap the bottom of the screen for a subtle hint about the words you are trying to solve. The design of Antitype is simple but beautiful. The words are like stencils on top the backgrounds that let the colors shine through. The sound effects lend a pleasant dimension to incrementing the letters and benefit from haptic feedback on the iPhone 7. Antitype is a great commuter game. It’s absorbing but as easy to play through a couple of puzzles as it is to play through dozens. I also appreciate that there are 325 puzzles included, so Antitype isn’t a game you’ll burn through in a day or two unless you play for hours at a time. In many respects, Antitype is the perfect companion to Typeshift, which I reviewed a few weeks ago. The mechanics of each are not the same, but there’s a certain commonality in their style and the way you approach the puzzles that should appeal to the same people. Antitype is available on the App Store.